In the 1980s, Jamaica’s protected agriculture sub-sector primarily consisted of producing cut flowers for export. However, it experienced a shift when increased competition from South America and an influx of disease caused the majority of these agri-businesses to close. More recently, increases in hurricane activity in the Caribbean Basin and other adverse weather conditions, international market competition, and plant disease have threatened the quality and consistency of Jamaican food production as well as domestic food security. As Jamaica works to meet new challenges in the global marketplace and seeks to address growing domestic and export market demand, the agriculture sector has the potential to benefit greatly from increased usage of agro-technologies such as greenhouses and other protected agriculture structures while developing a stronger, more reliable network of agricultural supply chains. 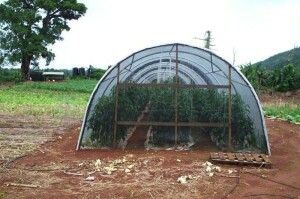 Protected agriculture technology includes more traditional style greenhouses as well as high tunnel houses and is the central component in the establishment of a more unified strategy for continued growth in the country’s agriculture sector. The sustainability of such development will essentially rely on the effective transfer of knowledge. This manual is designed to build the knowledge base of the Jamaican agricultural extension service, the Rural Agriculture Development Authority (RADA), so that it in turn can provide support and training to the members of Jamaica’s burgeoning agricultural sector. Incorporated into this manual are North American concepts, the local Jamaican experience, and lessons learned from Central America to provide the most up-to-date knowledge and technology currently available. The manual has undergone extensive reviews by expert local practitioners, agriculturalists, researchers and academics. A Curriculum Review Committee was established comprising of local growers, agriculture officials from the Ministry of Agriculture (MOA), RADA officers and overseas specialists in the United States of America and Canada. This committee provided invaluable feedback to ensure that the content of this manual is suitable for the Jamaican context.